Arcadia Down Alternative Comforter By Sferra | Bedside Manor Ltd. The Arcadia Down Alternative Comforter by Sferra is a staple at Bedside Manor Ltd. This item crosses the thermal insulating properties of down with the easy care of techno-fibers. A baffled construction allows room for the hypoallergenic 100-percent Micro-fiber fill to breathe, keeping it fresh and able to maintain the warming properties. 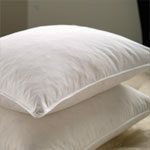 Finally, its shell is made from 330 thread count all-cotton sateen. A true delight! Pair with the Arcadia Pillow, another popular staple item.